The Wandering Palate’s UK correspondent, Alistair Scott considers the gratifyingly tangible aspects of a good old fashion,, family-run local wine merchant. So, what makes a great wine shop…or off-licence or bottle shop if you prefer? 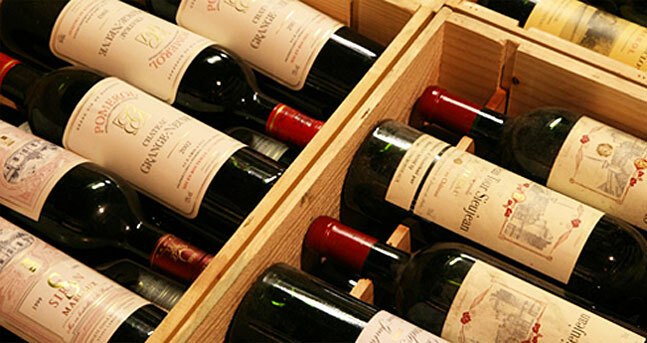 What is it that works best for you as a wine buyer? When the door bell pings and you look inside the store, what excites you and where are the best examples of the species to be found? I am not talking here about all wine merchants. Many merchants are major chain operations of greater or lesser but usually fairly consistent quality, range and personnel and offer a different experience from single premises – although an individual outlet could of course become a personal favourite. Some merchants indeed are effectively ‘virtual’, to use the lovable jargon of the internet age, but may be none the worse for that in terms of what they are trying to do – the long-established Wine Society in the UK continually wins plaudits for the range, quality and price of its offerings…but it’s not easy to form an emotional attachment to a list and a website, however commendable. I’m looking here at bricks, mortar and bottles that you can walk into when the mood takes you. I guess any reasonable shopping list could include range of wine regions covered (or deep vertical ranges for specific areas), knowledgeable staff, a definite sense of the ‘taste’ or enthusiasms of the staff and/or proprietor, some exciting differentiation from its peers-perhaps in terms of presentation or specialist knowledge, perhaps some interesting samples to sip…and then something one might try to call ‘atmosphere’ or ‘ambience’ that moves you from a cerebral to an emotional response (rather akin to that thing we often call terroir when we try to define a wine away from percentages of alcohol, acidity etcetera). I have a series of probably entirely unreasonable but deeply-felt prejudices about what I want in an outlet. The typical wine shop in much of Asia will try to emulate the old world with a few original wooden cases complete with splinters, plus posters and maps of various famous wine regions. But their location in a 3 year old mall, with air-conditioning whirring in the background, undermines much of their hard work at recreating that caveau feel, while the ranges still often revolve around ‘it better be red and it’s got to be France’. The staffing of such places is often characterised by puppy-like enthusiasm but, apart from a few older hands, lack of experience, although you might find a few younger European or Antipodean types enjoying a couple of years of expat living talking up their wine roots. At the other end of the spectrum, many of the olde-worlde type British based outlets fall short in some way. Jowly public school boys using cod Latin always make me suspicious, as do copious amounts of sawdust on the floor, and their pricing if often uncompetitive. Some of the old established houses such as Berry Brothers, a cork’s throw from St James Palace, have the mullioned windows, the aged floor boards, excellent ranges and loads of history but feel a little too self-conscious, a bit like Harrods or those Oxford students who like to patronise American tourists with the age of their college. The space between the shelves, where the bottles are all neatly placed, seems designed to allow crocodiles of Japanese (or nowadays Chinese) visitors to sweep through efficiently – a bit more passion seems in order. One place that excites me, and takes the family car on a major diversion every time we get up to the north of England, is a venerable merchant in the town of Clitheroe, in the Lancashire hills. Clitheroe is a small market town with a fine castle and an excellent position defending the Ribble Valley and has managed to retain the core of the old town centre. D. Byrne & Co started up in the 1870s and fits perfectly into the location, based in cellars running under a series of buildings in the old town and looking pretty much as they did when built 130 years ago. 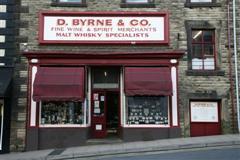 The Byrne family remain heavily involved in the operation, which may explain the maintenance of quality and feel of the place over the years. In terms of set up, the entrance leads to the tills and the spirits, including a terrifying range of malts, and the champagne and fortified wine section with a range of vintage and other ports. Clustered in piles around the floor is a selection of budget wines, often varietal, for those who want to grab a quick bottle on the way past or to fill out a case on the way to the till. In the larger room next door lies a long central row of cases of Bordeaux, keeping the more conservative customers of the north of England happy, with a slab of Burgundy in the corner and other French regions round the walls, with good names such as Domaine Tempier from Bandol, Jaboulet from the Rhone or Daumas Gassac from l’Herault mixed in with others. A modest selection of Germans include Dr Loosen but looks a bit thin against the rest of the world, as does the Austrian selection – some nice Gruner Veltliners and a couple of Rieslings but nothing too funky or red. The final section, through a dangerously low doorway, is a favourite, a lovely selection from the rest of the world, again good names such as Pieropan and Quinto do Crasto, Shaw Smith (but sadly not the shiraz) and Grosset, again with a balance of other names often at lower price points. So, excellent names, the space to display them with piles of alternatives, loads of history, staff who point you briskly at different options and will happily suggest good value, drinking ages and new names but don’t hover (even if they could in the limited floor space left between the racks). Prices are pleasingly competitive – a year or so ago I bought a magnum of Daumas Gassac here for about £2 more than a bottle of the same vintage cost at Nicolas in London. A token website unfortunately don’t help those of us who don’t always live in the neighbourhood… but then would I have the same sense of anticipation if I could browse and click online before visiting the store? Perhaps not – a little mystery can be a good thing for a gratifying retail experience.